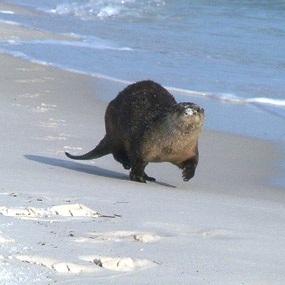 The river otter (Lutra canadensis) is a long, elongated water-loving animal found throughout Florida except the Keys. This playful animal is found from Mexico north to Alaska. They are especially abundant throughout Canada. Otters inhabit rivers, streams, lakes, ponds, marshes and inland waterways. These social animals may make their home in a hollow log or abandoned beaver lodge; however, they usually dig a hole into the bank of a stream or lake. This hole leads to a leaf-lined den. They may dig their own burrow, or remodel the burrow of a beaver. River otters use both freshwater and brackish habitats. This shy and secretive animal is a strong and graceful swimmer, with an ability to dive to depths of about 60 ft. Like other members of its family, the river otter has a long body, short legs, and a long neck. The head is broad and flattened and its muscular, tapering tail typically equals about one third of its total body length. The otter's body is very streamlined and flexible, generally 18 to 42 inches in length with the male being up to 30% larger than the female. Their coat is water repellent, short, smooth and dense. Overall, their color is dark brown, but the under-parts, throat and cheeks are somewhat lighter. Northern river otters have short legs and webbed toes to aid them in swimming. Otters can swim 3-4 mph underwater and up to 6 mph on the surface. They can stay submerged for up to 4 minutes. The river otter, a member of the weasel family, is equally versatile in the water and on land. Northern river otters hunt during the night and prey upon the species that are the most readily accessible. Fishes are a favored food among the otters, but they also consume various amphibians, turtles, and crayfish. There have been instances of river otters eating small mammals as well. River otters are among the most playful of animals. A lone river otter often amuses itself by rolling about, sliding, diving, or "body surfing" along on a rapid current. In family groups, otters take turns sliding and will frolic together in the water. A river otter makes the most of a snow slide by running to get speed, then leaping onto the snow or ice with its forelegs folded close to its body for a streamlined toboggan ride. Otters mate year-round, with activity peaking in late spring and early summer. The gestation period is about 2 months In late spring, expectant mothers begin to look for a den where they can give birth to the yearlings they will soon have. 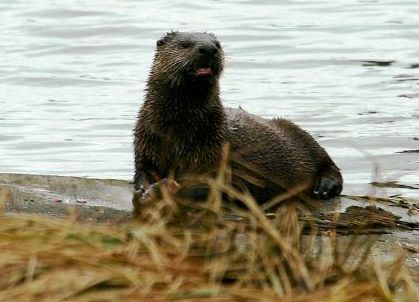 The female otters do not dig their own dens; instead, they rely on other animals, like beavers, to provide suitable environments to raise their offspring. When the mothers have established their domain, they give birth to several kits. Litter size can reach five, but usually ranges from one to three. Each otter pup weighs approximately five ounces. At birth, the river otters are fully furred, blind, and toothless. They stay with their mother for about a year while she teaches them to find and catch food for themselves. Otters reach sexual maturity in about 2 years. North American river otters usually live to 21 years of age in captivity, but they can reach 25 years of age. However, they normally live about 8 to 9 years in the wild, but are capable of living up to 13 years of age. The otter has few natural predators when in water. Aquatic predators include the Alligator, American Crocodile, and Killer Whale. On land or ice, the river otter is considerably more vulnerable. Terrestrial predators include: the Bobcat, Mountain Lion, Coyote , Domestic Dog, Gray Wolf, Red Fox, and Black Bear. Most river otter mortality is caused by human-related factors such as trapping, illegal shooting, road kills, and accidental captures in fish nets or set lines. Accidental deaths of river otters may be the result of ice flows or shifting rocks. Starvation may occur due to excessive tooth damage.